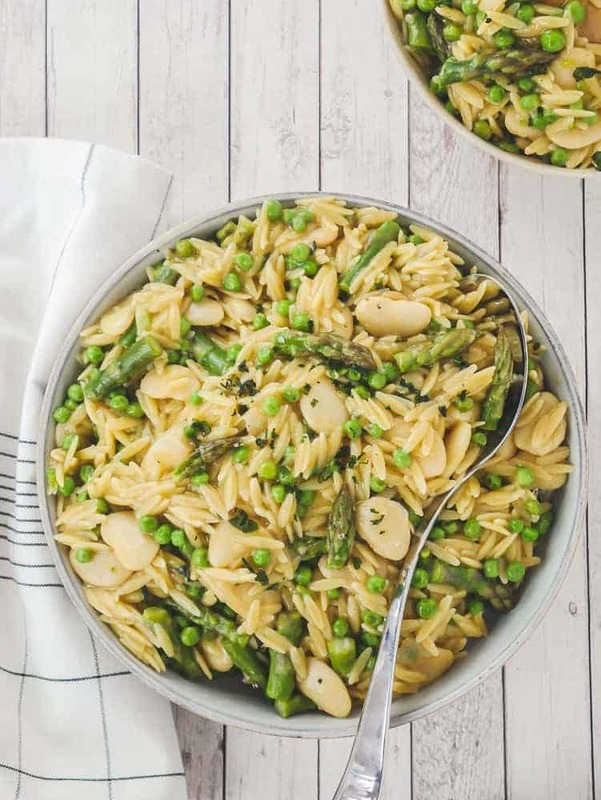 Celebrate spring with a light & creamy vegan orzo dish! 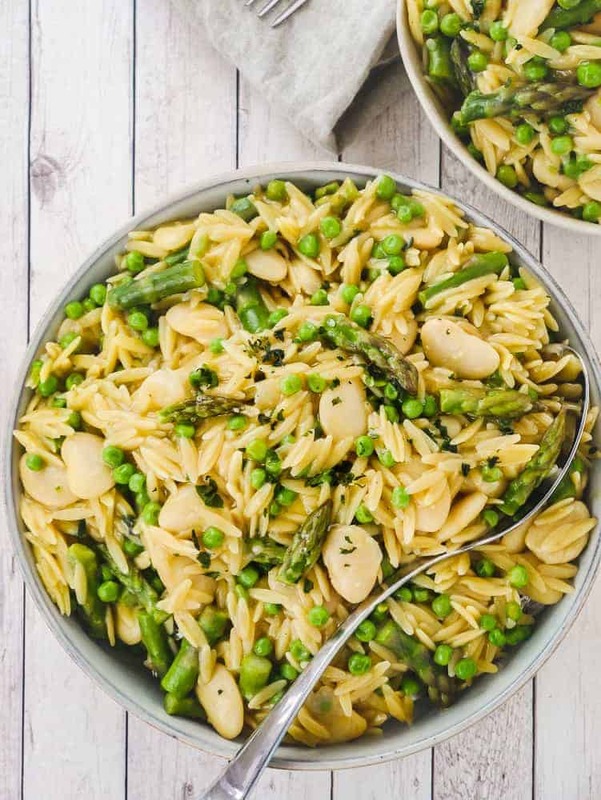 Delicate pasta, crisp asparagus, sweet peas and butter beans are perfect for Easter brunch. I just want to grab that spoon and take a BITE! The spring equinox is here and bringing with it more light and growth … TECHNICALLY. We live in the Colorado mountains, and still have snow piles as tall as my 9-year-old. So, our fireplaces are crackling and we’re still cozied up in flannel jammies. But for a couple days each week, we have these gorgeous bluebird sky Colorado days. It’s like a crayon box… Cloudless perfectly blue sky, green trees, white snow. The air is cool and crisp, but the sun is warm. We trade heavy, warming chilis, stews and curries for something a little lighter. I make jokes about meatless dishes being “rabbit food”! But, sometimes rabbit food is LEGIT delicious. Asparagus, sweet peas and butter beans are perfection and springtime gifts. I debated making this a cold, pasta-salad type of dish… but we’re not quite ready for the summer picnics and cook-outs. I mean, I have to leave the state to wear shorts in April! 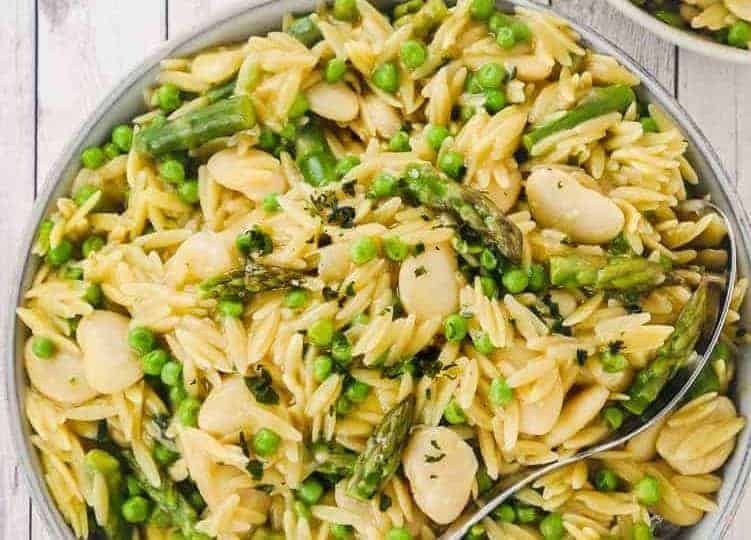 So this is a warm & creamy vegan orzo dish, but still light and delicate. 20 grams of protein per serving also makes this a filling meatless entree. Hurray for grocery-store staple ingredients. There’s nothing fancy or specialized in this dish, and using in-season produce means it’s cheaper too. Food bloggers spend a lot of time making “casual messes”! If your kids help you make this dish, and make a mess, it’s ok. Just channel your inner food blogger LOL! Heat a large, non-stick pan over medium-high heat with a drizzle of olive oil. Add chopped asparagus with pinch of sea salt. 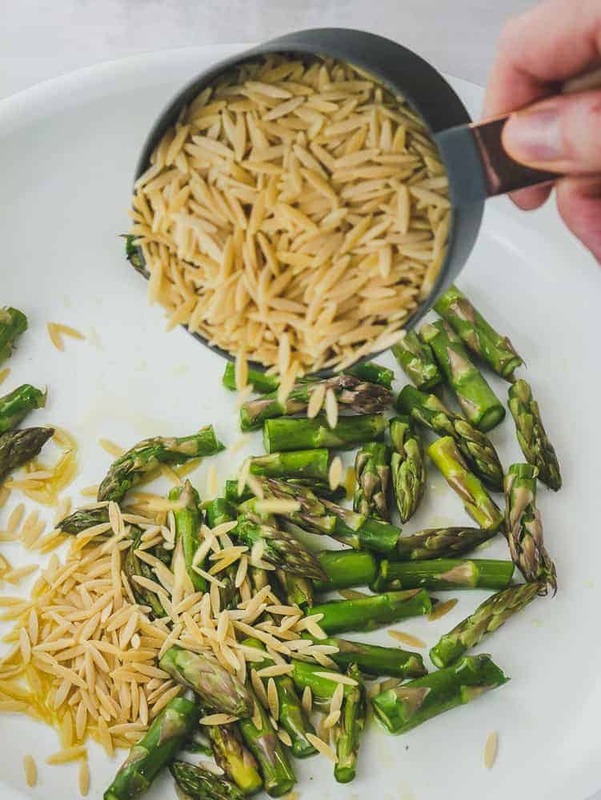 Cook asparagus for 3-4 minutes, or until turn that beautiful, spring green. Add orzo to the pan. Toast for a minute or two, stirring ocassionally. Next, add your comically-oversized butter beans, vegetable broth and salt to the pan. If you haven’t tried butter beans before, you’re in for a treat! They live up to their name… soft, creamy and mild. Increase the heat to high, and bring to a boil. Then, reduce to a moderate simmer over medium-low for about 10 minutes. At this stage, the orzo should be near al dente but not soft & cooked through. Also, don’t bring it to a roaring boil as you would with an ordinary pot of pasta. The butter beans are delicate. Stir every few minutes to ensure the mixture does not stick to the pan or clump.If you live at high altitude, you will need to increase the cooking time by a couple of minutes. Add frozen peas to the pan. They cook very quickly. We like to eat them straight out of the freezer! While the peas thaw and cook, grab a little bowl. 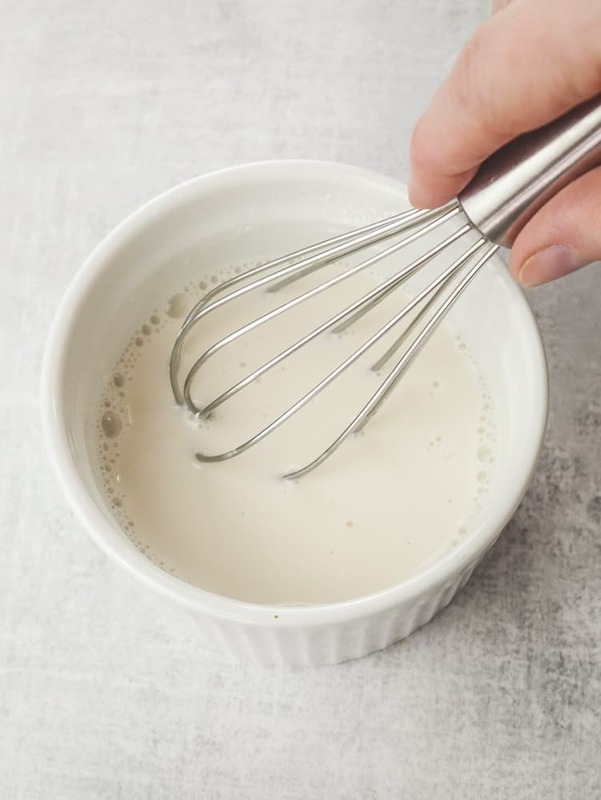 Whisk together corn starch and almond milk until smooth. Slowly pour the cornstarch slurry into the orzo mixture. Whisk the dish to spread the cornstarch throughout. Let the dish continue to simmer for 3-5 minutes, as the corn starch thickens the sauce. Add a pinch of fresh or freeze-dried basil. Then salt and pepper to taste. It’s ready to serve when a spoon or spatula can cleanly push the sauce aside. Creamy, delicious and 100% dairy-free! Hungry for more one-pan plant-based dinners? This dish was loosely inspired by: One-Pot Orzo Primavera @ Cafe Delites and Parmesan Herb Chicken Mushroom Orzo @ Spoonful of Flavor. This creamy vegan dish is perfect for using what you’ve got. I’m sure not running to the grocery for butter beans if I have chickpeas! Pasta substitutions: While not tested yet, Israeli (pearl) couscous, ditalini, or other very small pasta shapes should work well. Herb substitutions: Fresh or freeze-dried dill or sage would be equally delicious replacements for basil. Vegetable substitutions: Zucchini, mushrooms and other quick-cooking vegetables would be delicious replacements for asparagus. 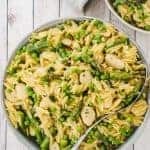 I would not recommend substituting other frozen vegetables for peas, as peas cook uniquely fast. High altitude: increase the cooking time by a couple of minutes. Only use a non-stick pan for best results. Reheats well in the microwave for work or school lunch. Herbivores can enjoy as a main dish. 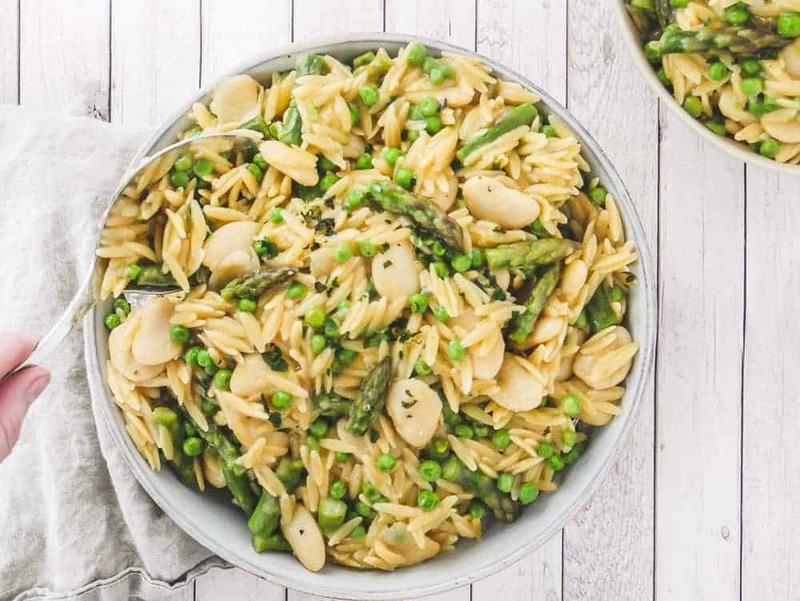 The perfect creamy vegan orzo dish for springtime: delicate pasta, asparagus, peas and butterbeans in a light, creamy sauce. Heat a large, non-stick pan over medium-high heat with olive oil. Add asparagus and a pinch of salt. Cook for 3-4 minutes until bright green. Add orzo pasta to the dry pan and toast for 2 minutes. Add butter beans, vegetable broth and salt. Bring to a boil, then reduce heat to a moderate simmer (bubbling throughout but not a hard boil). Stir occasionally to prevent the dish from sticking to the pan. Cook until pasta is almost al dente but not cooked through. Add frozen peas and stir to combine. 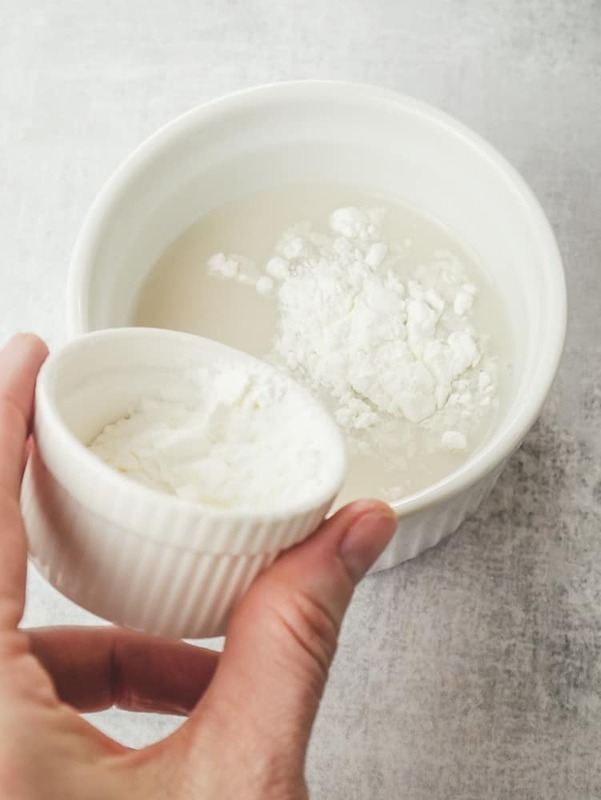 In a small bowl, whisk cornstarch into almond milk until creamy. Pour into orzo mixture and continue whisking to distribute evenly. 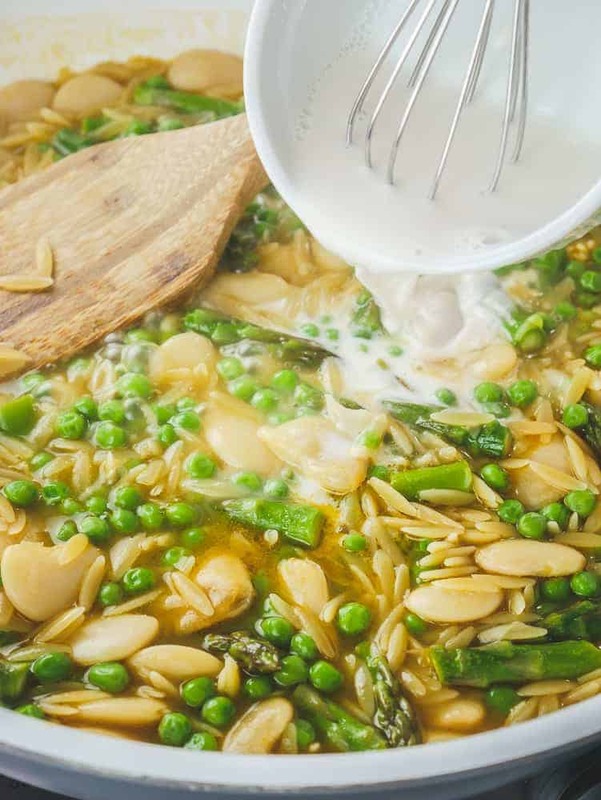 Continue to simmer for 2-3 minutes, or until thicken enough for a spoon/spatula to cleanly push the creamy orzo. This dish is vegetarian and vegan / dairy-free. This dish is not gluten-free. It’s possible that gluten-free pasta may be substituted, but that has not been tested. What a lovely spring dish! 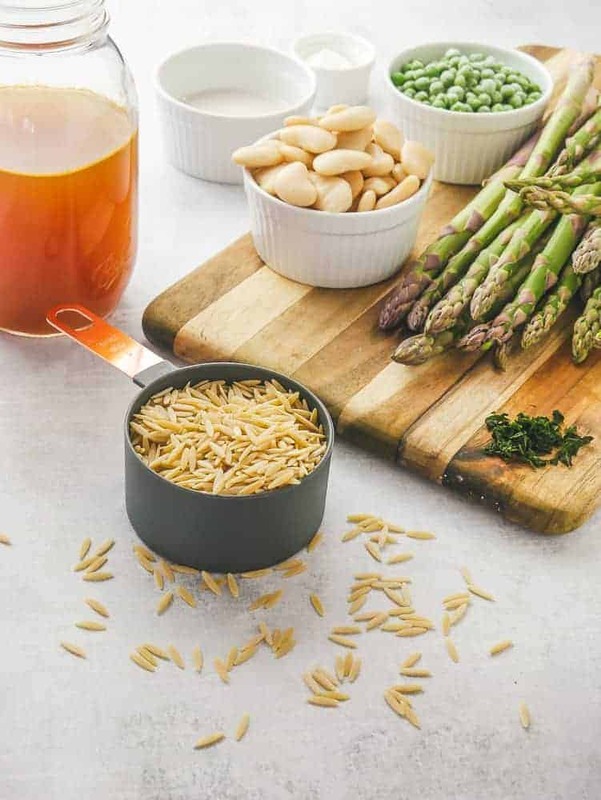 I much prefer orzo to pasta, especially in the warmer months. This is such a lovely Spring dish. I especially like the butter beans. I don’t see too many recipes that use them! Great touch. I made this for lunch today and OMG it was delicious! I can’t wait to make it again! A dish made in 30 minutes and in one pan! I’m in! This looks super delicious and comforting! Thanks for the recipe! Wahoo! Compliments the whole table round (including a 4 year old and 6 year old)!!! I used cow milk instead of almond milk because that’s what I had. We also had a bowl of goat cheese crumbles on the table so everyone had the option of adding it or not. Delicious!!! We will be making this for our family Easter meal! *Tosses confetti in the air* HURRAY! I’m so happy to hear that your family loved it as much as mine… the 4yo even?! HIGH PRAISE! Thanks so much for feedback. 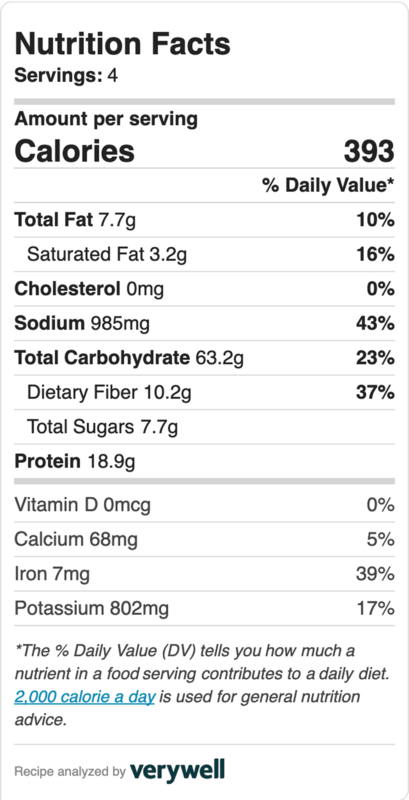 It’s helpful to know that dairy worked just as well, I’ll update the recipe to include that! Thanks so much, Jerica! 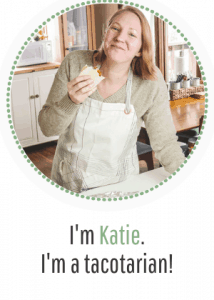 We are a movement of real people who want to cook easy, craveworthy veg meals. You’re bored with kale. Your family wants steak. … You’re in good company!